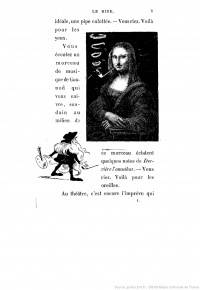 This page Mona Lisa Smoking a Pipe is part of the laughter series. "Voici un tableau de maître représentant une femme d’une beauté éclatante. Supposez, un instant, que, par hasard, le maître ait laissé dans la bouche de cette femme idéale, une, pipe culottée. — Vous riez. Voilà pour les yeux." "This is a masterpiece depicting a woman of striking beauty. Imagine for a moment that, by chance, the master has left in the mouth of this ideal beauty, a cheeky pipe -.. You laugh. For the eyes. " The work directly prefigures the famous Marcel Duchamp image L.H.O.O.Q. of 1919. The Oxford Critical and Cultural History of Modernist Magazines erroneously states that it was first shown in 1883 at the second "Incohérents" exhibition. The image is on the cover of The Spirit of Montmartre: Cabarets, Humor and the Avant Garde, 1875-1905 by Phillip Dennis Cate. 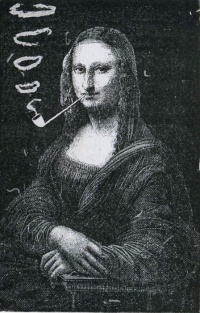 Unless indicated otherwise, the text in this article is either based on Wikipedia article "Mona Lisa Smoking a Pipe" or another language Wikipedia page thereof used under the terms of the GNU Free Documentation License; or on original research by Jahsonic and friends. See Art and Popular Culture's copyright notice. This page was last modified 06:18, 12 September 2014. This page has been accessed 11,254 times.